New members, existing members and club instructors etc, can download the official licence application form here. Once completed it must be signed off by the relevant club instructor and sent direct to the association licence officer (Chris Denny - full details are on the contacts page) with the correct remittance. If the form is printed off at your home it needs to be printed so that all sections and signatures are on the paper and are clear to read. If this is not possible, a blank form can be obtained from your club instructor. Please note: Licence forms that are not fully completed and signed, are illegible or do not have the correct remittance included will be returned to the sender. Ask you club instructor to check and sign the completed form for you before sending, in all instances. Click on the licence form icon (Left top) to view and download. Click on the licence form rules icon (Left middle) to view and download. Click on the Licence System T's & C's (Left bottom) to view and download. If a licence book becomes lost, a replacement can be obtained at a cost of £3.00 (plus £2.00 for SSU UK licence slip and £3.00 for EKF slip, if needed). 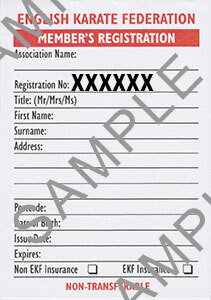 If your current licence book becomes full of signatures for events attended, a NEW licence book is available on request. The three images above show the current SSU UK Licence Book and the two licence slips that live (stuck down, not loose) inside the rear cover of your licence book. They show whether you are licenced or not. The EKF slip is needed for competitions and seminars and is recorded on the EKF national database. This number will be checked on a competition day against your name, address and DOB. 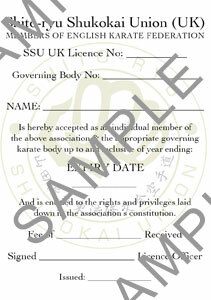 The SSU UK Licence slip shows your membership to the SSU UK and is your insurance proof. Both of these slips have expiry dates on them. 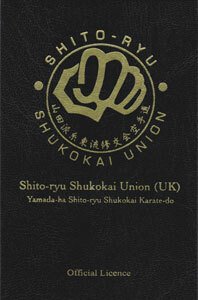 They both need to kept inside your licence book at all times and shown at any SSU UK open courses, seminars, competitions, gradings and need to be in date at all times.